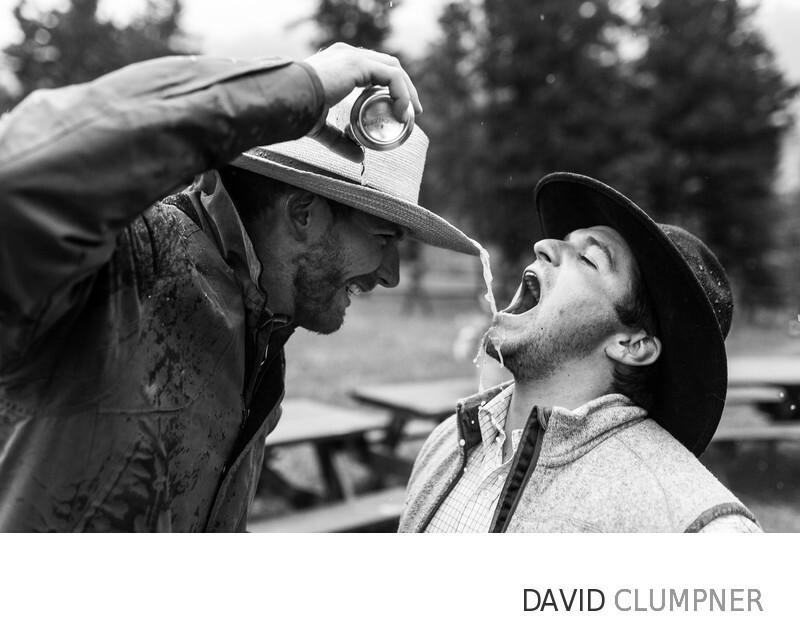 Cowboy culture is a tough thing to capture outside of the range or a rodeo and especially so at a wedding. But when a wedding is held at a guest ranch before the guest ranch opens to the public and the brides work at said guest ranch, the staff wear their cowboy hats and boots and let loose like they aren't allowed to during the on-season. Bethany and Sheena's hiring of Montana Wedding Photographers to shoot their wedding at Lone Mountain Ranch was a smart move because we are accustomed to the crazy elements that can be encountered during a mountain wedding, particularly one in March. These two guys celebrated the snowfall instead of running inside. Instead of following the easterners to the warmth, they busted out a beer, poured it into a cowboy hat, and drank off the resulting stream. Or, in this guy's case, tried his hardest to get the stream to land in his mouth but failed because they were both laughing too hard. But as with all Montana weddings, the joy is in the unpredictable and the fact that couples make the weddings their own. In this case it was crazy weather without a rain plan, but often it's just people having a friend officiate the wedding or involving pets or horses.